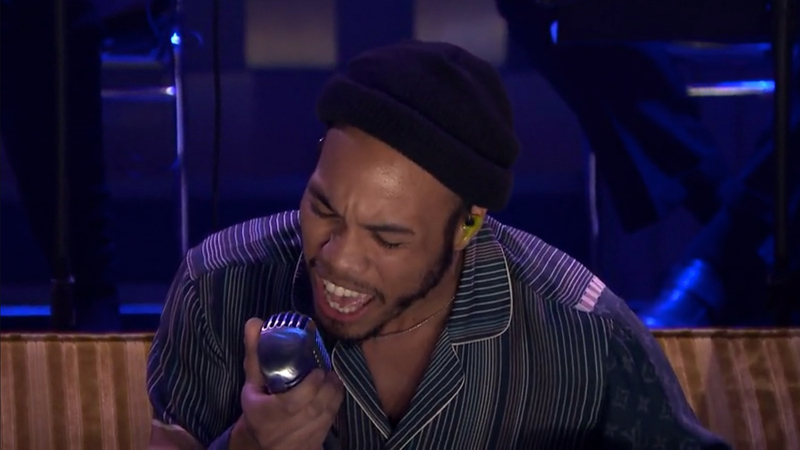 Grammy-nominated artist, Anderson .Paak, and producer, Knxwledge, stopped by The Tonight Show With Jimmy Fallon for a very special Valentine's performance last night. The two musicians, who make up the group NxWorries, brought roses, a couch, and a love triangle to the stage for a theatrical rendition of their hit, "What More Can I Say". Seated for the duration of the performance, .Paak serenaded two women with the track from the duo’s LP, Yes Lawd!, which was released back in October. For the scene, .Paak attempts to gain back the trust of his two lovers that he has cheated on, but they aren’t paying any mind to his pleas for forgiveness. At the end of the song, Knxwledge gets up from his keyboard, intervening to swoop both ladies off their feet with flowers in hand, leaving .Paak all alone on the couch. The studio audience, as well as Fallon himself, roared with applause after the elaborate piece from the two musicians was over. If you enjoyed NxWorries’ spot on Fallon, be sure to Track them so that you can see them live!